and liminal / border spaces. The island is an image with a long symbolic heritage. It is a symbol of the human condition – and at the same time of the extreme. It represents the individual and her /his realtion to society. It is a symbol of an (almost) closed system – like the earth or an egg. And if something breaks in? 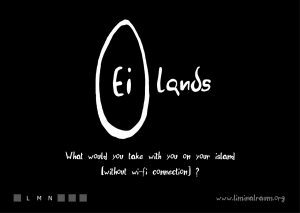 Ei-lands is a performative process that opens to the public after intensive working sessions. With it LMN is experimenting on a new method, that questions the borders between performance and theater. The members of LMN, usually spread in Germany, France, the Netherlands, Poland meet each other in diffent places to work, step after step, on this experiment. Ei-lands – Obsession from LMN – Liminale Räume on Vimeo. Ei-perspective from LMN – Liminale Räume on Vimeo. Trailer Ei-lands from LMN – Liminale Räume on Vimeo. (ei)lands from LMN – Liminale Räume on Vimeo.